The Senior Friend Finder dating site is there to make it easy for singles aged 50 and over to meet new people on the internet. It is not only for those looking for a serious relationship, but also for anyone looking to make new friends or just enjoy the company of others. It is part of the FriendFinder Network, which operates a number of online dating sites. Senior Friend Finder was launched in 1999 and they have an impressively large membership base; they recently claimed over 400,000. They have a strong record of successfully helping their members and you will find a number of testimonials published on the site. The site is very much focused on being easy to use so you don’t need to be a computer genius to sign up. You can always use their telephone based customer support if you need some help. You can sign up and create a profile at Senior Friend Finder for free, but you will only have limited use of the site. The actual process is really straightforward and it takes just a few minutes to get signed up and complete your profile. You are only required to provide very basic information about yourself and what you are looking for to start with, but you can choose to provide more details if you want. It is advisable to include as much as possible on your profile as you are more likely to receive contacts from others if your profile contains plenty of information. You should also add at least one photo to your profile too, and you can even include a video introduction if you want. All profiles have to be approved before they can be viewed by other members, but this is usually done within one day. 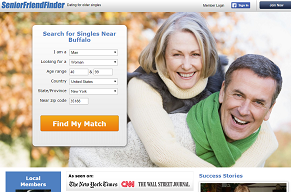 Finding potential matches at Senior Friend Finder is not difficult and the search functionality is quite versatile. You can search based on a number of different criteria and have the option of doing basic searches, such as members that live in your area, or more advanced searches if you are looking for specific characteristics. Alternatively, you can do a search for anyone that is looking for the same kind of relationship as you. You can contact anyone that attracts your attention by sending them an email or using the instant messaging feature. You can also chat with another member in real time if you are both online. All of this is done directly through the website, so you don’t have to give out any personal information to another member when you first contact them. There are also a number of chat rooms where you can communicate with a group of other members at the same time. A particular feature of Senior Friend Finder that seems well liked by the members is the interactive online magazine. This is made up mostly of contributions from members, and there is the option of leaving comments or question on any of the articles. Combined with the active chat rooms, this helps to foster a real sense of community– which is a big factor in the popularity of this dating site. You can also create your own personal blog if you like the idea of sharing your thoughts with other members. You can pay for membership at Senior Friend Finder on a month by month basis at a cost of $22.59 per month, or you can save some money by buying longer subscriptions. A three month subscription is charged at $33.42 and you can get a whole year’s membership for $98.42. You can also choose to pay extra for Gold Membership. This gives you a few extra benefits, notably that your profile will appear higher up in listings and searches – resulting in more people seeing it. Senior Friend Finder is unquestionably one of the best dating sites for seniors. It is very simple to use but still offers a high level of functionality. The costs are very reasonable, particularly if you take the one year membership, and there is a very large membership made up of people looking for all kinds of different relationships. Whether you are searching for love or friendship, there is every chance that Senior Friend Finder will have a match for you.